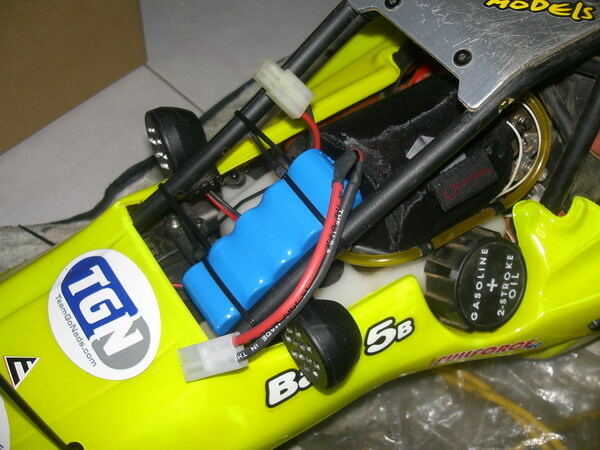 HPI Baja 5b SS! Race Preparation!!! The race starts at 5 am (yes, FIVE in the morning!) at the FRT track which actually is two tracks: One asphalt, with a layout suitable for LS 1/5 onroad cars and by its side is the dirt track we raced back in October. The format of the race will be as follows: 5 to 7 am there will be a two-hour race on the asphalt track, with no external lights provided, then there will be a pause of 40-0 minutes, and the three-hour dirt race will start.It will certainly be an adventure! 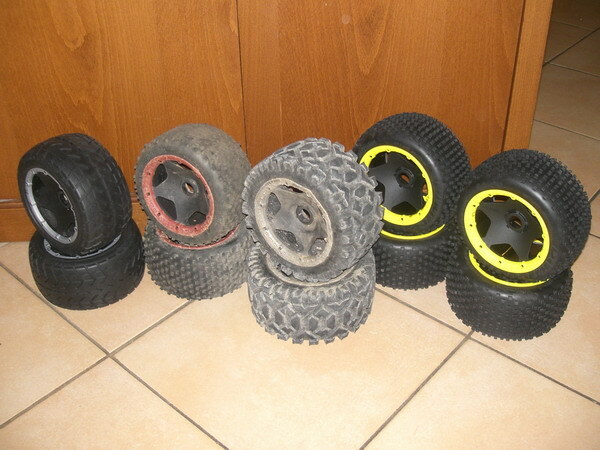 ...and we started the vehicle preparation: We bought two pairs of mounted Dirt Buster tires from Fanatix.gr, and we did some preparation to them as well. 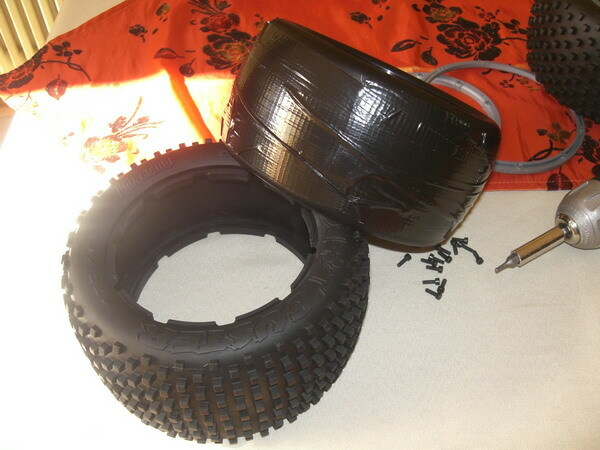 I tried two different ways of remounting the tires, after I put a double layer of duct tape around the foam, so that the foam will not balloon and destroy the tire in the process. The first one, as seen above, was the hardest to remount, it seems! I did not unbolt the outer beadlock bolts. 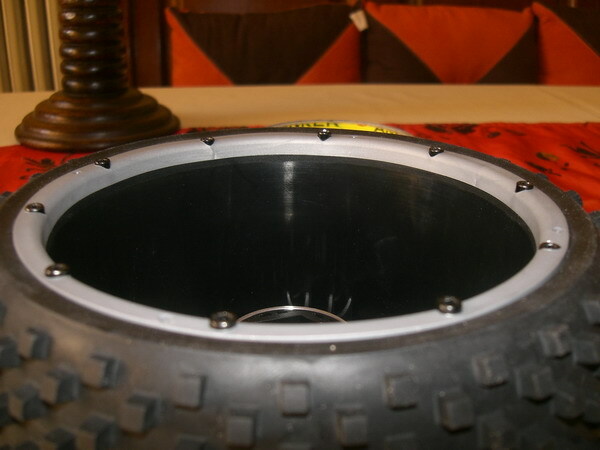 I turned the tire inside out, taped the foam and then just bolted the inside beadlock. 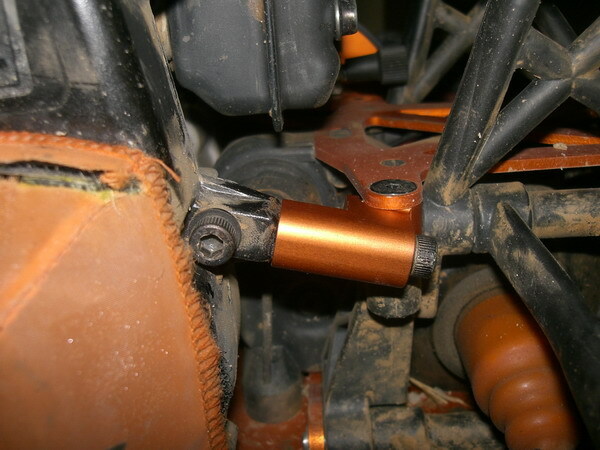 ...with an orange anodized one from GH Racing. 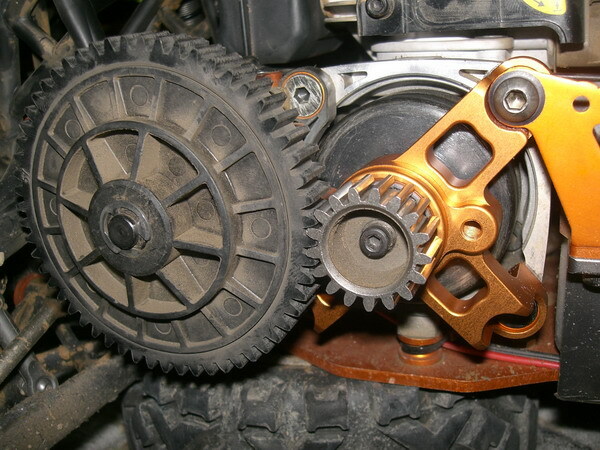 It's stronger, of course, and hopefully it will keep the clutch and pinion gear in perfect alignment through the race and bashing. 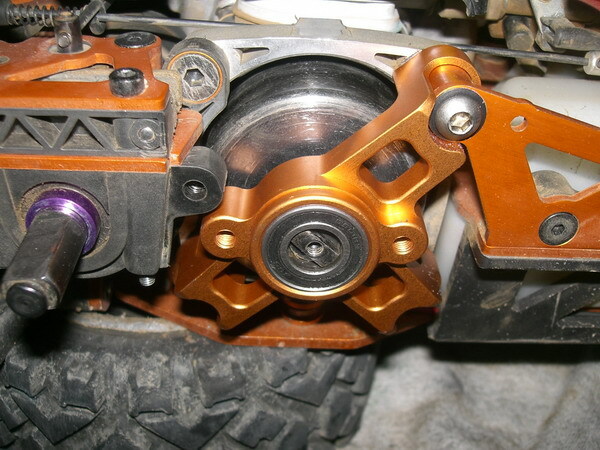 I also found the chance to shim the clutch bell carrier bearings with Team Fast Eddy shims. It needed one 0.5mm and one 0.1mm shims. 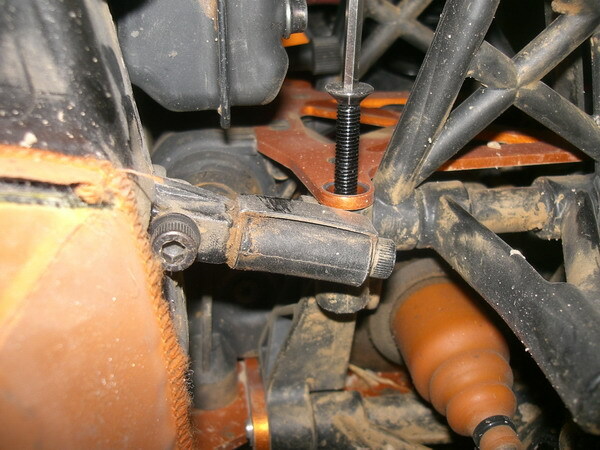 Another place I believe is quite stressed is the left rear engine mount. 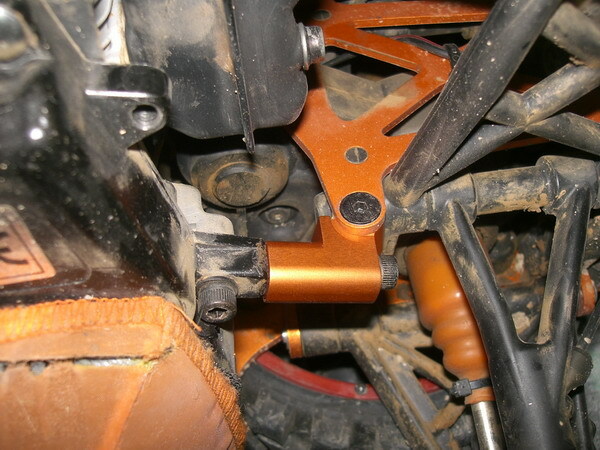 Again from GH Racing, the orange anodized engine mount. I bought all these from the nice folks at Dave's Discount Motors. 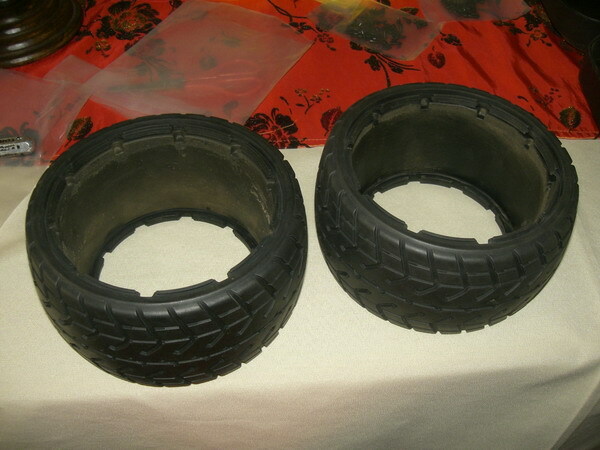 Since Fanatix was not stocking Tarmac Busters at the moment, I ordered a pair from MMR Large Scale in the UK. 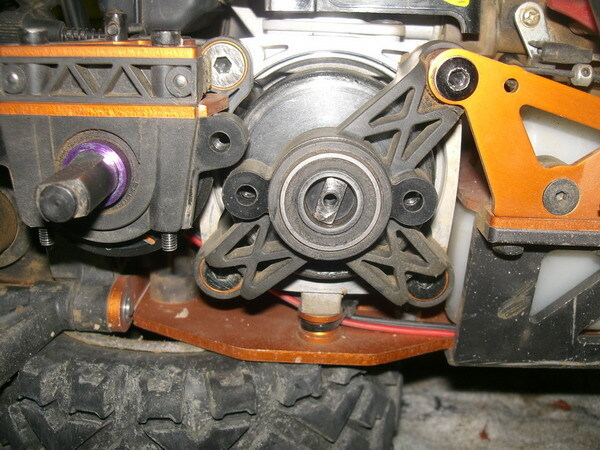 I mounted these on a pair of used wheels I had, which had seen better days before hitting the dirt with Dirt Busters! 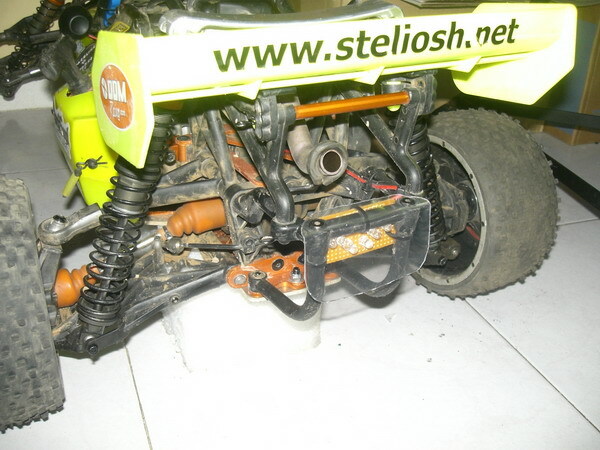 I removed the old tires, checked that the foams were in good shape, washed the wheels with soap and hot water, and after they dried, I sprayed the outside with some silicon spray. They now look *almost* good! 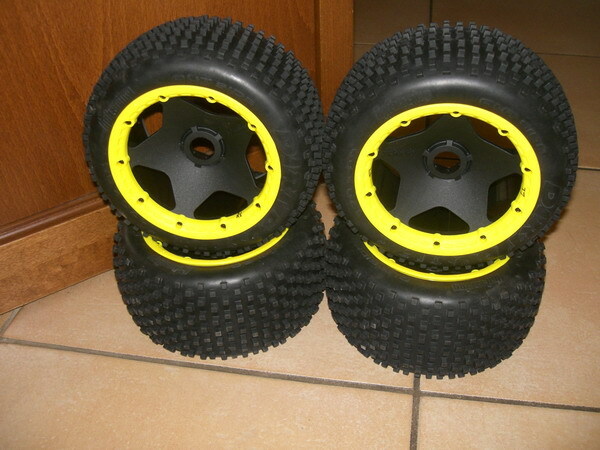 Also from MMR Large Scale, I bought two pairs of HD yellow beadlocks, to match my new look paint! From left: Tarmac Busters, used Dirt Busters, Hostile A/T's for the asphalt part (even though I believe the Hostiles will be deemed illegal! 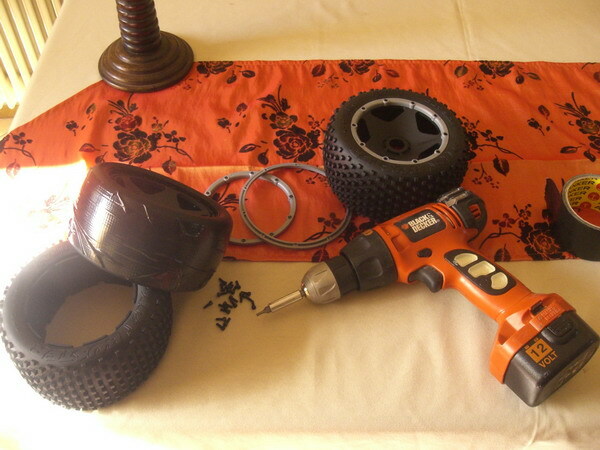 ), and a couple of pairs of mounted and taped-foamed Dirt Busters for the three-hour dirt part. 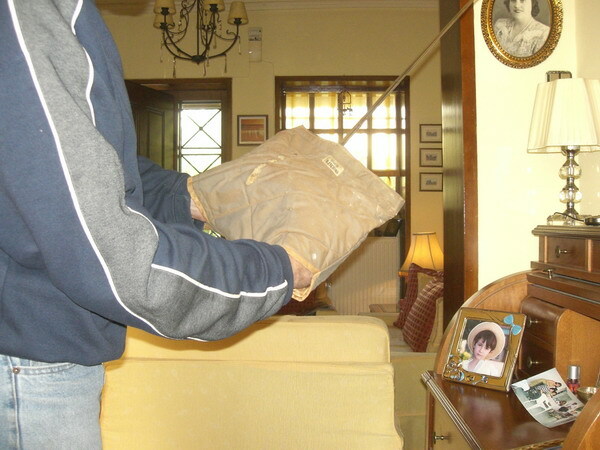 ...a very useful handmade warmer. This one was made by my sister some 20 years ago! 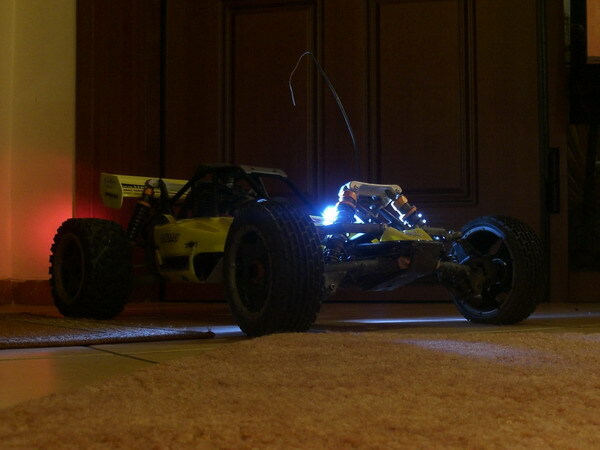 It's very useful, since it was modelled after my hands holding the Futaba T3UCP. On the top there's velcro stitched, so you can insert the transmitter and leave the antenna protruding. You can drive without feeling the cold, and the finger movements are undisturbed! Talk about taking care of the team drivers!!! 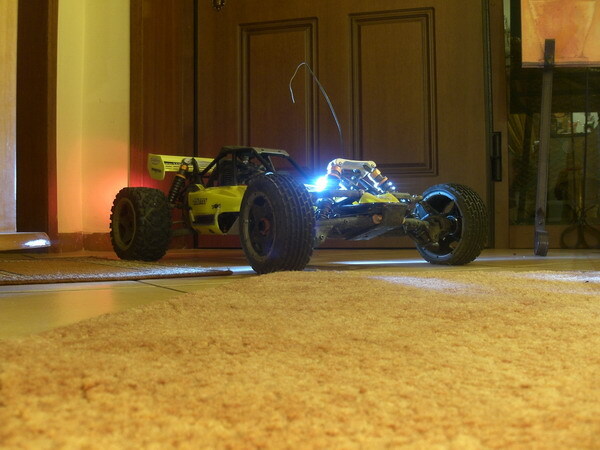 A 1300mah nimh 5-cell battery to power the lights. Of note are the TGN prefilter and the string Outerwears filter cover that slips over the TGN easily and then can be strung around it! 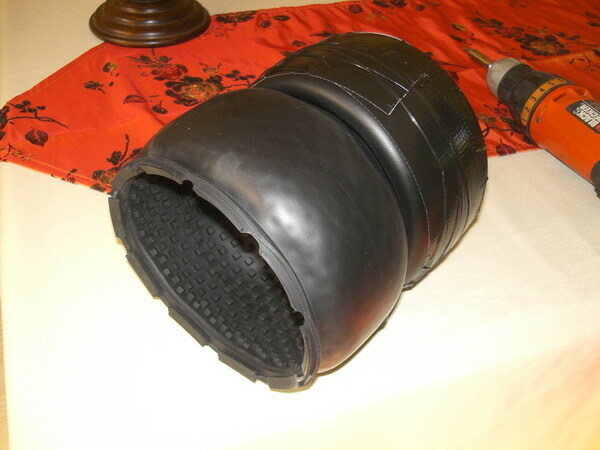 I previously had used the elastic Outerwears but it was really a struggle to put it on, over the larger TGN prefilter. A lexan protector for the rear lights. Wisgh us luck for the race! Latest news (on Saturday night) are that the track is wet, and is going to stay that way all night long, and we will see how muddy the dirt track will be!!! The good news is the weather promises to be sunny tomorrow! Not that we expect sun before 7.30 am anyway!! !